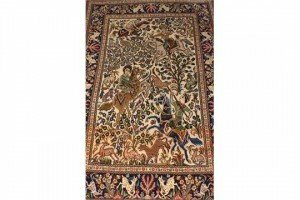 A handmade Persian silk ivory ground rug, the central hunting scene with dark blue border. 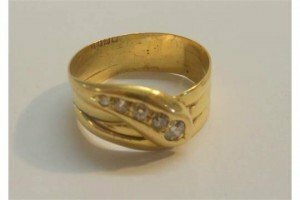 An 18 carat gold gentleman’s snake ring with graduated diamonds to head. 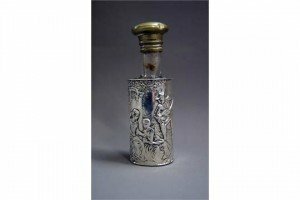 A Continental-silver and glass scent bottle with relief figural decoration. 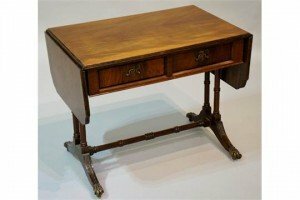 A mahogany small sofa table of conventional design, the figured top with reeded edge above two short drawers on columnar trestle ends and reeded swept legs with paw feet. 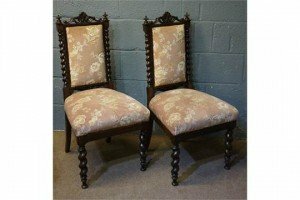 A pair of Victorian rosewood hall chairs with barley turned uprights and legs. 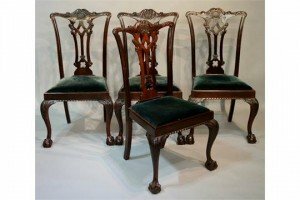 A set of four Chippendale revival dining chairs with foliate carved top rails, waisted Gothic splats, drop-in seats upholstered in blue velvet above gadrooned aprons and acanthus carved cabriole legs with claw and ball feet. 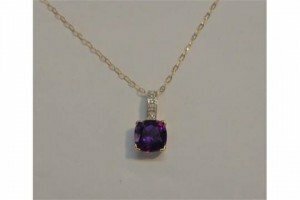 A 9ct Gold Pendant Set Cushion Shaped Amethyst with diamond points on light gold chain. A 9ct Gold Pendant Set Diamonds, oval cabochon setting with diamond points, on light chain. 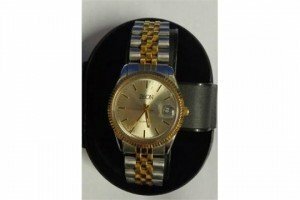 Gents Zeon Quartz Wristwatch with bi metallic strap, contrasting gilt dial with date aperture, silvered dial with baton markers, with certificate & box. 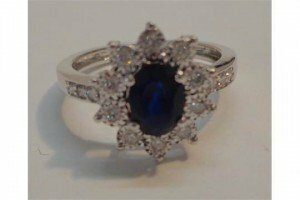 An 18ct White Gold Sapphire & Diamond Ring, centre oval facet cut sapphire surrounded by 10 diamonds with diamond point set shoulders. 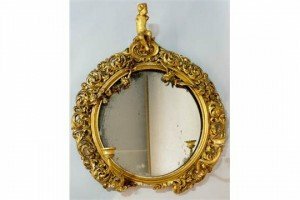 An early Victorian gilt wood and gesso girandole with cherub finial, the circular plate within a moulded border and frame of scrolling leafage, floral pendants and pair of scrolling candle brackets. 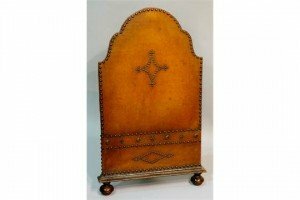 A leather fire screen of arched form with studded borders and decoration, oak framed with splayed base and compressed bun feet. 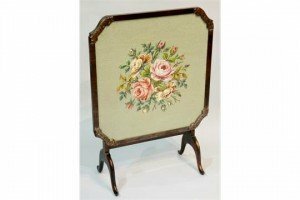 A folding table, the shaped square top with floral carved corners enclosing a glazed panel upholstered beneath with a floral spray on a green ground in gros-point, trestle ends and swept feet. 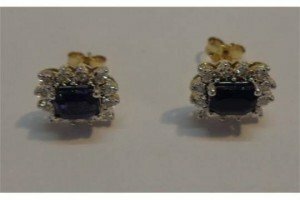 A pair of 9ct Gold Sapphire & Diamond Earrings with central emerald cut sapphire surrounded by 12 diamonds. 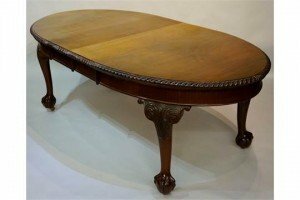 A Chippendale revival oval dining table with leaf carved gadrooned edge, acanthus carved cabriole legs with massive claw and ball feet, the table with two additional leaves. 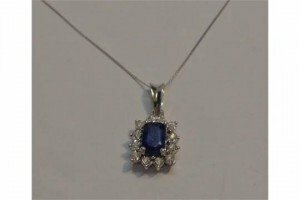 A 9ct White Gold Ladies Sapphire & Diamond Pendant, emerald cut sapphire surrounded by 12 diamonds on white gold light chain. 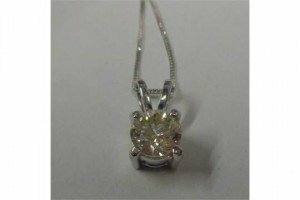 An 18ct White Gold Pendant with bifurcated extension loop, set solitaire diamond 0.90ct on fine chain. 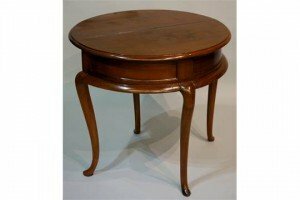 A George II folding table, the top with moulded lip above a deep panelled frieze with splayed apron and cabriole legs on pointed pad feet. 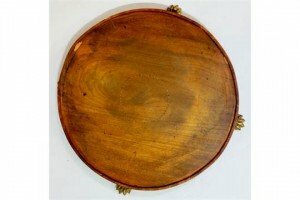 A circular mahogany tray inlaid to the centre with a barber pole strung circle, mounted on four brass lion paw feet. 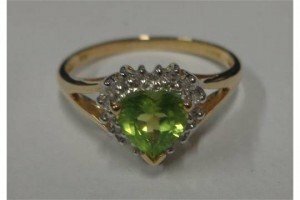 A 9ct Gold Heart Shaped Peridot Ring with diamond point surround, bifurcated shank.